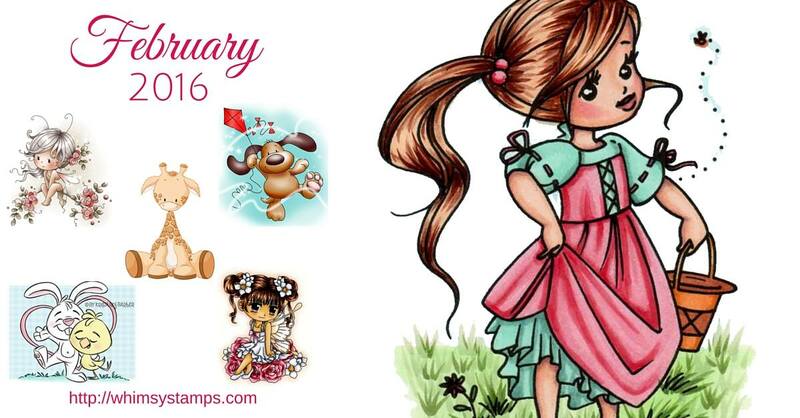 First things first Whimsy Stamps has a new release coming out and everything is adorable! I couldn't resist using Eizabeth Bell's new image. She's just too cute for words. Meet Honey Little Spring Helper. Don't you just adore her?! Eeep! The sweetness. I wanted her to have an ethereal background, like she was walking trough the forest with the floating sun spots. You know what I'm saying? I stamped her down and then masked her so I could add distress ink in the background. I used Tumbled Glass, Salty Ocean, Twisted Citron, and Mowed Lawn blending from the left and fading off toward the right. To create my sun spots (is that even what they are called?!) I splattered on some droplets of WPlus9 shimmer spray. I wasn't working on watercolor paper so I used a very light hand. I removed the mask and waited for it to dry. Once my sun spots were dry I colored in this little sweetheart with my copic markers. I used E50, E00, E11, E04, E42, E44, E47, E49, R81, Y00, Y21, Y23, Y26, B32, B95, B97, B99, YG01, YG03, and YG17. I added some details with a white and black pen. I added some white flowers to the grass and to her basket along with some pinstripes to her bodice using the white gel pen. With the black I added a bit of basket weave to the top and bottom of her basket. I also outlined the whole image. The sentiment was stamped in WPlus9 Pure Color black ink and is from their Doodle Buds set. I thought it fit nicely. Speaking of WPlus9 I'm over on their blog today sharing a video on two ways to color your dies cuts. I'm also popping in on the Make it Crafty Blog with my husband's Valentine's day card. It's a little different from my normal style but it is for him after all. The image is called Penny & Scott Cuddle and it's perfect for a subtle Valentine. That's all for me! Haha! Three amazing and beautiful cards! All different and all fabulous! Fabulous cards Kelly - love how versatile you are and how you can achieve so many effects with different techniques. It's always a pleasure to visit. oh my Kelly these are ALL amazing. I just especially love the girl with your partial background. AHmazing. Kelly you have been one busy lady. Love all your beautiful cards and video...learn so much about coloring from your video. Kelly three beautiful cards, love the versatility of your colouring, each so different to each other. Beautiful, thanks for sharing. Holy_____, these are all amazing!! Girl, you are so talented! Impressive!! Love see the different styles! Wow, all three cards are fabulous. I especially love your hubby's Valentine. Very nice! You are a busy gal!